Wade Flemons had a very interesting career, and he died way too young in 1993 at age 53. Born in Kansas, his family moved to Michigan when he was young. Wade became a performing musician while still a teenager, and by age age he was signed to Chicago's Vee Jay label, where he released many fine r&b singles. 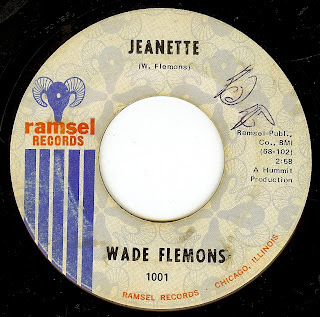 After Vee Jay folded in '65, there were no releases from Wade until this release on the tiny Chicago label Ramsel in 1967. In my opinion, this was his finest work; a self composed song of tremendous power and infectious drive. Seems as though this record could have easily been a smash hit had it received wider distribution. Around the same time, Wade joined forces with Maurice White in The Salty Peppers; a group which evolved into Earth, Wind And Fire by 1970. As a songwriter, Wade was a co-writer of "Stay In My Corner"; one of The Dells biggest hits in 1968. Wade remained in EW&F until Maurice fired and restructured the group in 1973. This seems to have been the end of Wade's involvement in the music biz. "Jeanette" is easily one of the greatest could-have-been hits of the late '60's, and it's a record that has been sought out by collectors since the 1970's.